Bill Clinton speaks at Dorothy Emanuel Recreation Center on April 7, 2016. Former President Bill Clinton was in Philadelphia on Thursday to speak in support of his wife's bid for the 2016 Democratic nomination, but what was meant to be a rally for Hillary turned into a shouting match with Black Lives Matter protesters who criticized Clinton's legacy of crime and welfare legislation. Clinton was at the Dorothy Emanuel Recreation Center a day after Hillary Clinton, speaking at the AFL-CIO convention, took a sharp tone on trade relations with China and attacked rival Bernie Sanders on the issue of gun control. 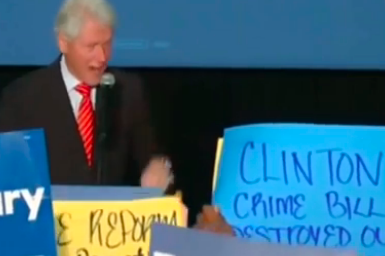 As Clinton defended the record of his 1994 Violent Crime Control and Prevention Act, citing low murder rates and a drop in gun violence during his two-term presidency, he was interrupted by protesters who held up critical signs and accused Hillary Clinton of "crimes against humanity," Politico reports. Usually a smooth operator, Clinton eventually lost his calm and accused the protestors of defending criminals who endanger the rest of society. “See these other signs? This is what’s the matter," Clinton said. "I don’t know how you would characterize the gang leaders who got 13-year-old kids hopped up on crack and set ‘em out onto the street to murder other African-American children. Maybe you thought they were good citizens. She didn’t." The incident comes as both Hillary Clinton and Bernie Sanders wrap up stops in Philadelphia to fight for the battleground state of Pennsylvania. A crowd of more than 10,000 people packed Temple University's Liacouras Center to support Bernie Sanders, who labeled Clinton as "unqualified" and shared his platform to reverse extreme inequality, provide greater access to higher education and weaken corporate control of the electoral process. Despite a recent streak of primary victories for Sanders, Clinton leads him in Pennsylvania by a margin of 22 points, according to a poll released this week. Nationally, Clinton holds a 1,749 to 1,061 delegate lead over Sanders, with 2,383 required to secure the party's nomination. The next primary caucus comes April 9 in Wyoming, followed by an April 19 primary in New York. Pennsylvania voters will cast their Democratic primary ballots on April 26, joined by voters in Delaware, Connecticut, Maryland, and Rhode Island.